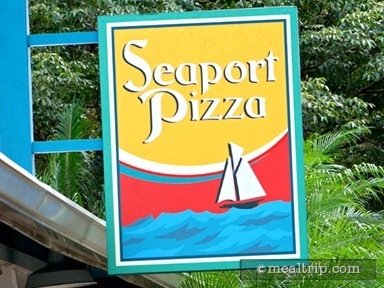 In the shadows of Manta, Sea Worlds “flying position” coaster, Seaport Pizza offers a great spot to feel the power of the high-power attraction as the “Manta” flies by a few feet away. 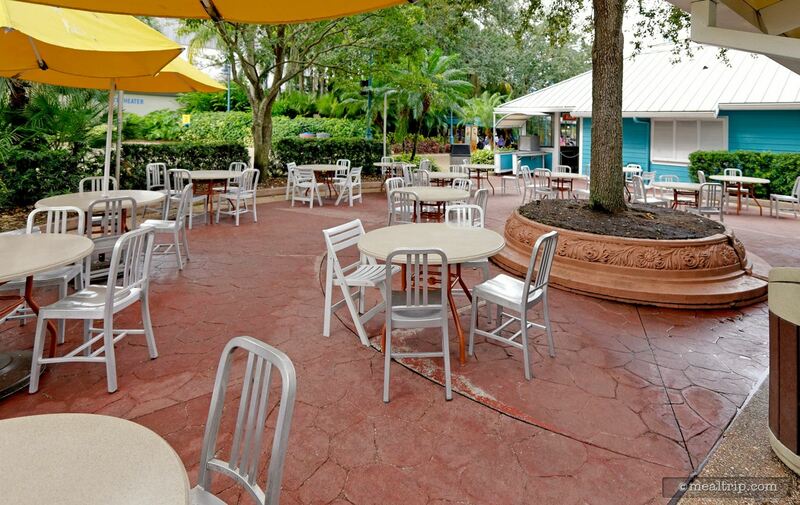 There’s also a “quiet”, covered seating area on the right-hand side of the main pizza pickup windows. 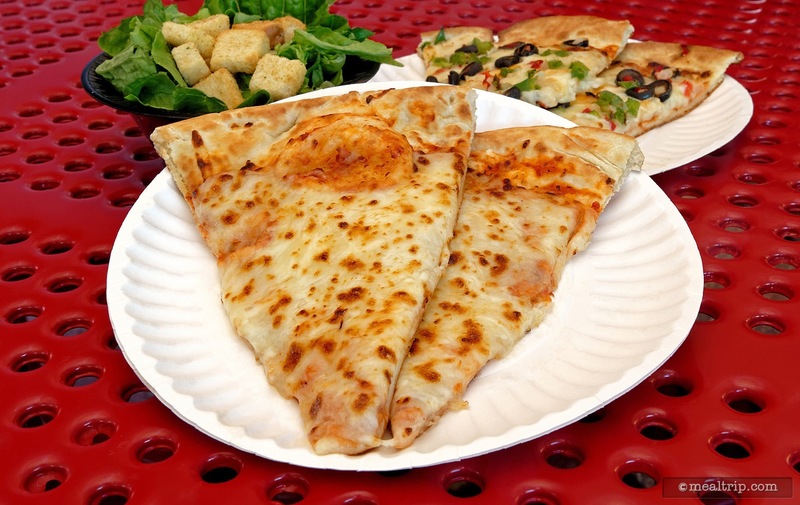 Several pizzas are featured including cheese, Pepperoni, Supreme and a Veggie pizza. 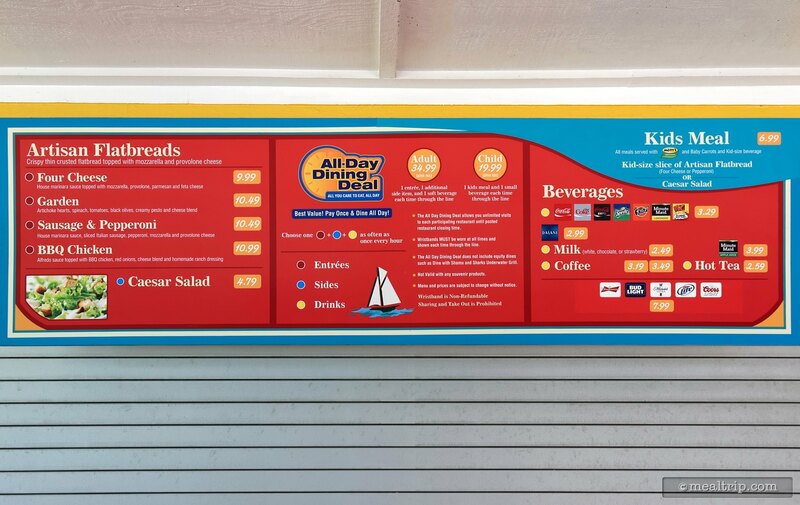 There are chicken nuggets on the children’s menu, and sides such as assorted fresh fruit, small salads, and desserts are also available. Disapointed with this large two slice pizzas. 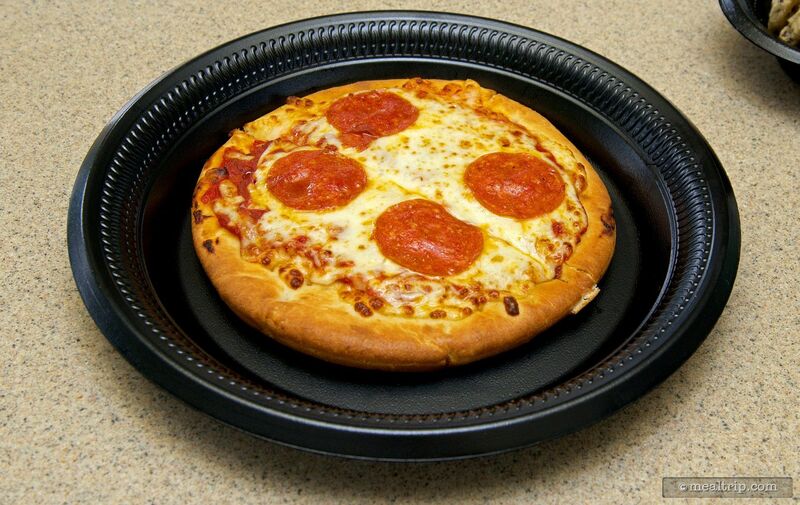 Bring backthe small whole pizzas that had flavor and served right out of the oven. Inside theme parks, it is really difficult to find an eatery that doesn't offer up some small nugget of goodness. They are designed to appeal to the masses, and so culinary high-brows may find the food somewhat lacking. Usually, the unique environment comes to the rescue and at least provides some eye candy while you dine. 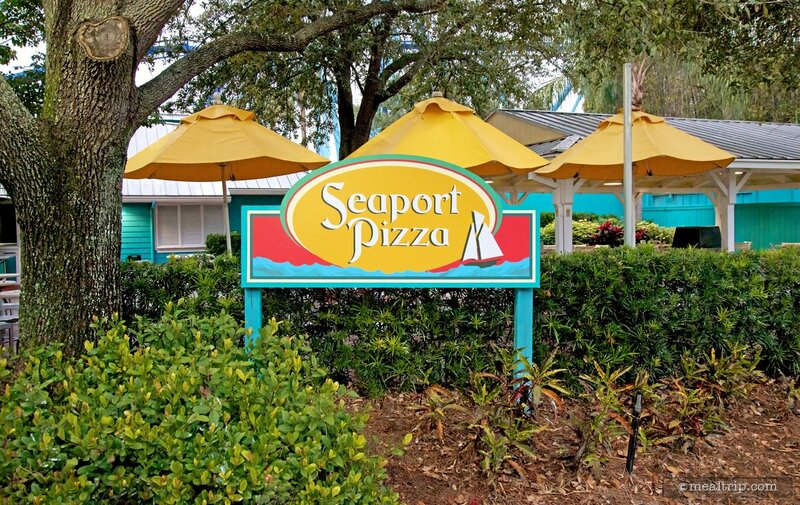 SeaWorld Orlando's Seaport Pizza had not received terrible reviews in the past. 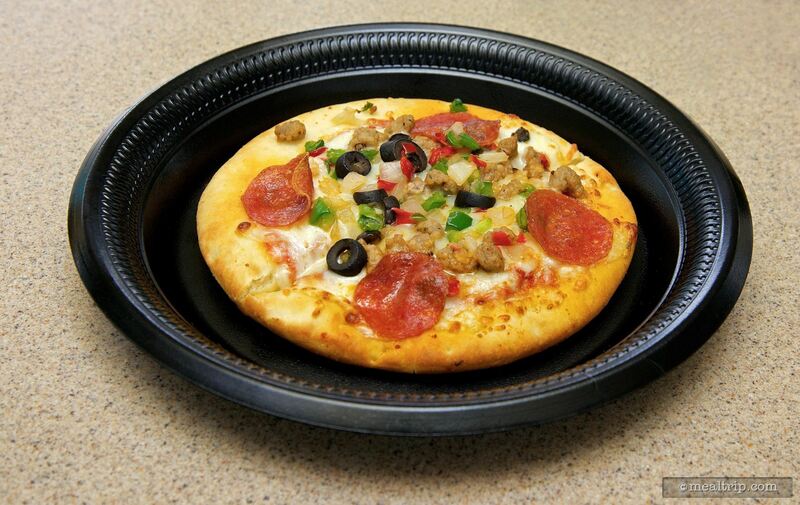 In fact, we found the cute little personal pizzas to be… well… they were cute, let's just leave it at that. Being a counter service location, it doesn't have the richest styling or any waiters or waitresses per say, so… it is, what it is… quick pizza. 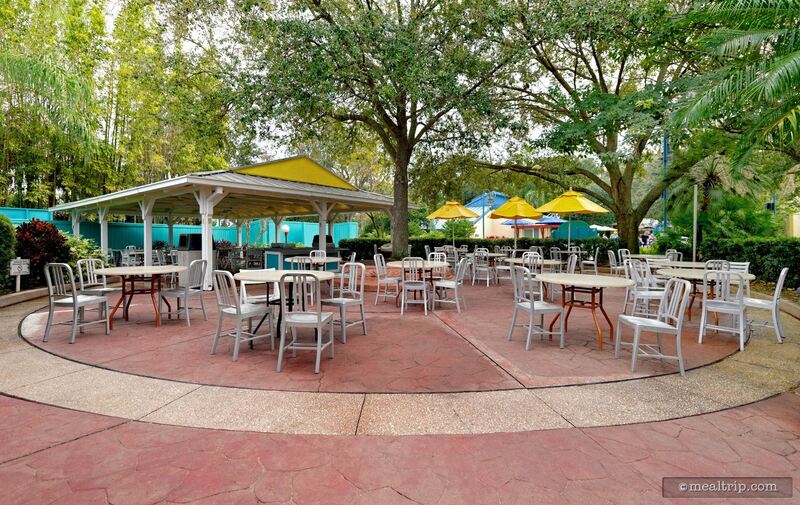 Pizza it seems, is much more difficult to "do" at theme parks than you might think. 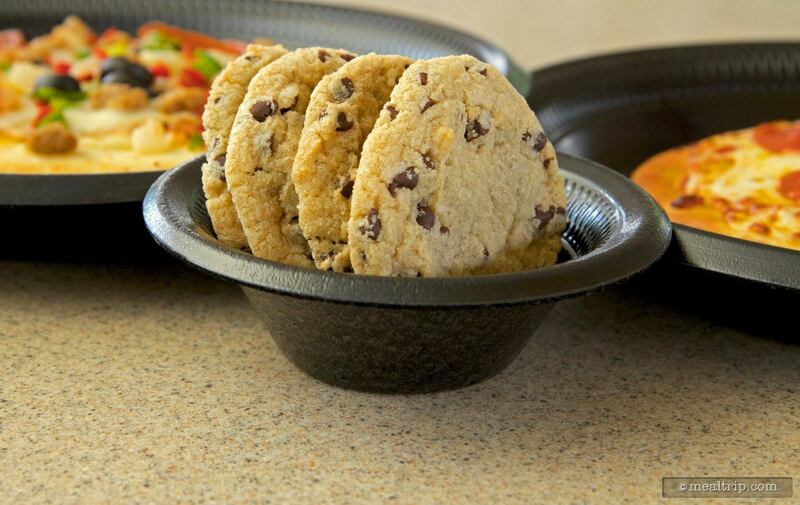 When you get one at your favorite home-location, it's probably made to order. That luxury is reserved for "table service" restaurants at theme parks, and so any theme-park counter service location is going to be pumping out pizzas right and left, destined for heat lamp resting before it lands on your plate. This isn't the best way to make pizza enjoyable. 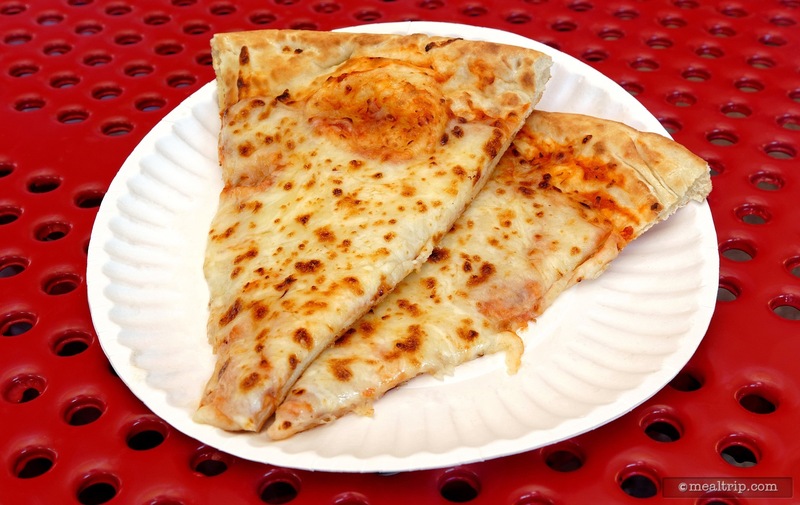 There have, however, been some improvements with pizza in general at theme park giant Disney-based locations… most notably a shift into calling them "flatbreads". Flatbreads... are a way of putting all kinds of stuff on thin, hot bread… all while not calling it pizza. You know what though… it kind of works! With selections like "Shrimp Flatbread" with Roasted Shrimp, Tomato, Red Pepper, Alfredo Sauce or the "Caprese Flatbread" and "BBQ Pork Flatbread" at least you can say "well, you don't see that everywhere". My point in all of this, is to let readers know I'm comparing apples to apples here... and not just intentionally tanking Seaport Pizza. I honestly, really, completely do hope that the next time I go back, that things have improved. Okay, the service… was practically non-existent on the day I visited. At this particular counter service location, cast only plate your food, and take your money… there really isn't room for any other interactions. But I mean, a simple smile would at least make me feel glad I stepped in line. Most guests have traveled hundreds if not thousands of miles to visit the eatery that you are working in… at least pretend that you're glad to see them. As far as environment goes, what little there had been in the past... has now been removed. I'm speaking specifically about the tables and chairs. It wasn't great before, and now it's worse. Bright red and yellow playground-style, full of holes, completely uncomfortable, and frankly inaccessible to those guests with disabilities, one-piece table things have replaced what once had been flat tables with pull out aluminum chairs. Presumably, the holes in the table and attached bench-style chair is to keep them from holding rainwater (because this is only a partially covered location), but inexplicably... I found even the fully covered tables needed a good wipe down with a wad of napkins. 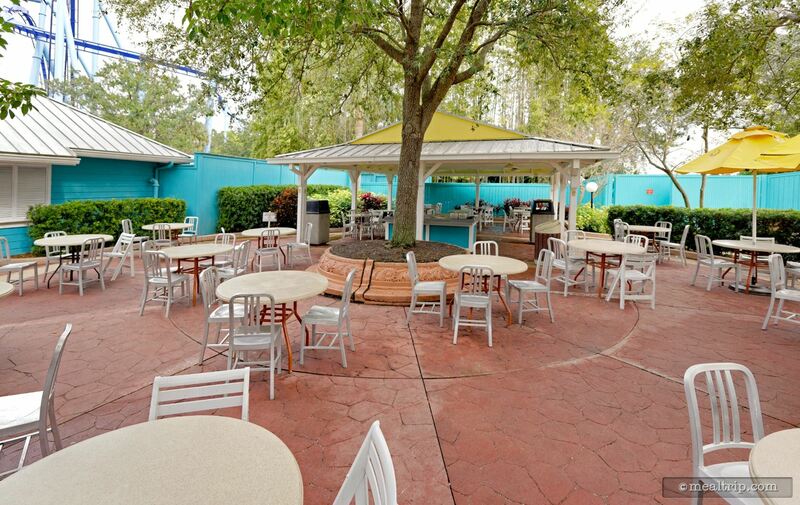 Rather than having cleaning staff check on the dining areas (we waited around for 45 minutes without a single cast member), SeaWorld has cleverly trained a team of White Ibis birds and small squirrels to clean up after guests. Pizza crust, salad leaves, napkins, small babies, everything seems to be fair game for this entertaining and annoying gang… but… at least they were cleaning up the area. Which only leaves us with the pizza. That, I'm sorry to report, was not great. In every respect, you would be better off getting a frozen pizza (from anywhere) and microwaving it back at your room. Gone were the cute little personal pizzas from our last visit, and even the cute little plates that they were served on. Instead we were given two slices of a larger pizza, on the kind of paper plates that you would find at a really bad tailgate party. The pizza didn't have any temperature, or flavor. 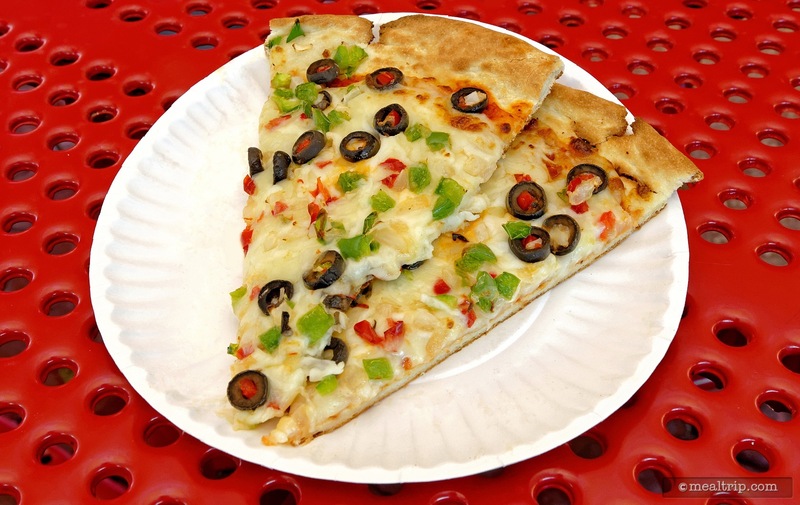 In fact, textural differences were even a little hard to detect as tons of flavorless gummy cheese that you have to chew like bubble gum were seeming all that these pizzas were made out of. I did "see" bits of olive, pepper and onion on the "veggie" pizza, but they did not have any individual flavor. 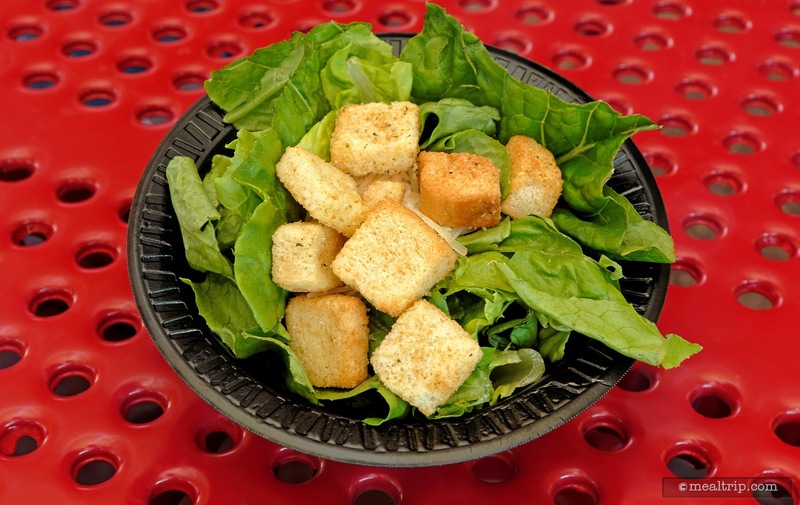 A Caesar side salad never elevated itself beyond being the sum of it's parts, which were basically dark green, room temperature, dry lettuce, a dozen croutons, and shreds of what looked like dry asiago cheese. Dressing was provided by way of a small sealed cup that you have to pour on yourself. Like most salads at SeaWorld, this one was difficult to eat because the lettuce was cut larger than the other items in the salad. Lower a plastic fork into the bowl, and pretty much everything on top of the lettuce will come flying out. Fear not though… this is the moment that the birds and rodents have been patiently waiting for. You won't have to look at your spilled salad for very long, before it gets whisked away by the wildlife. 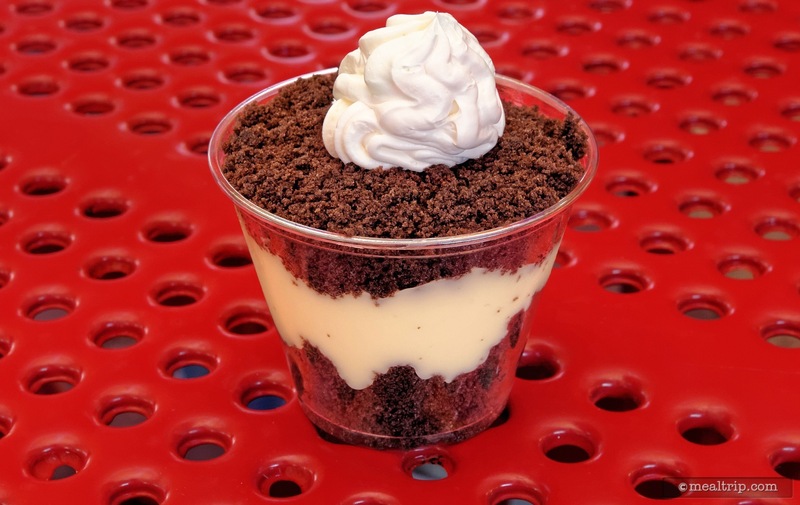 The desserts at SeaWorld are usually pretty good (for counter service locations), and I guess if I had to find one positive thing to write about, it would be that my "Vanilla Pudding Cup with Chocolate Crumbled-Up Something Above and Under It" (I don't think that's the official name of the dessert), was pretty much just as edible as it is at any of the other counter service locations at SeaWorld. That being said… it would not be my first, second, or third choice, out of the various desserts that are offered. I'll be back… in a year or so, to see what has changed… but based on my last experience, I really can't recommend this one at the moment. 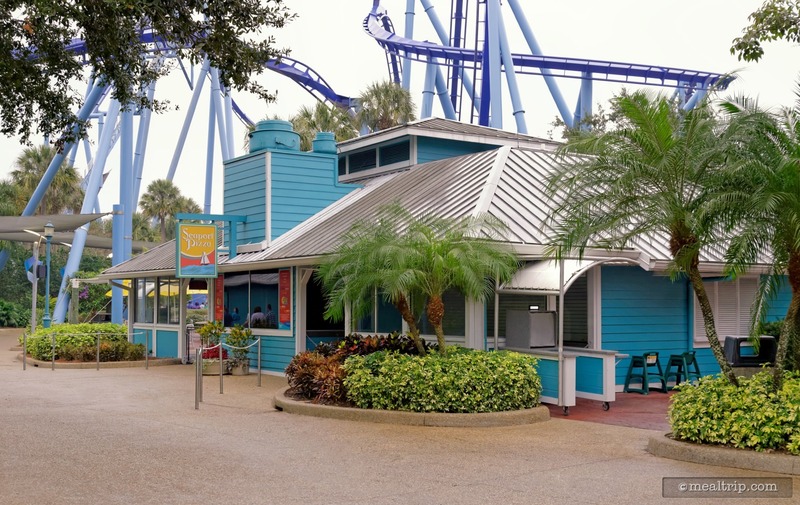 We have heard, that with the recent upper level management change at SeaWorld, some food changes will be taking place over the next several years. 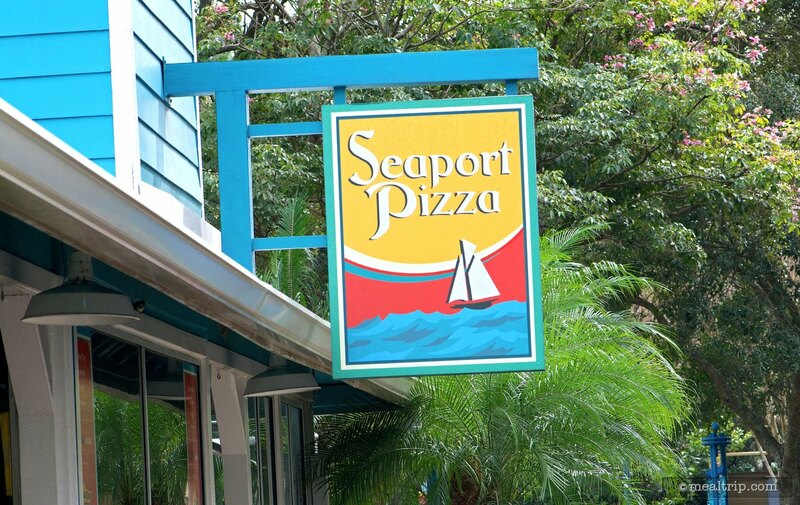 I for one, desperately hope that Seaport Pizza, is on someone's radar for an overhaul. The pepperoni pizza was the best we've had all day. Counter service is great and helpful and friendly. 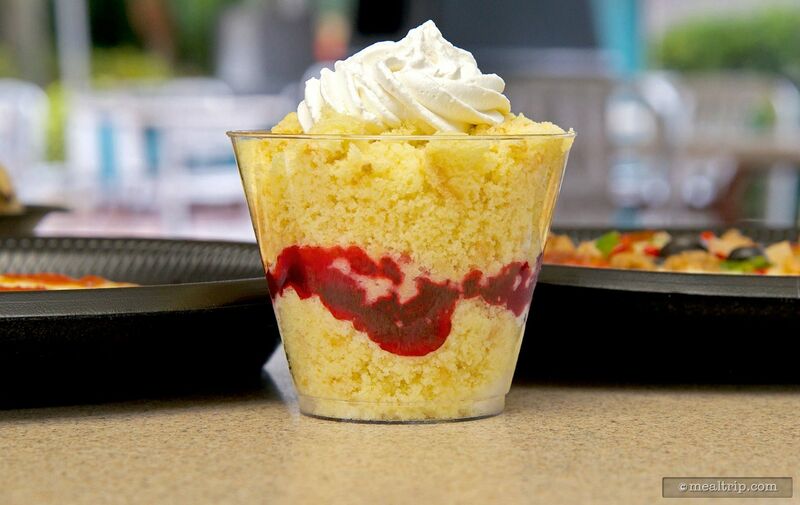 The strawberry parfait was bland. The chocolate chip cookies are o.k. sort of dried out. Try the supreme pizza as well for a second choice. CLICK HERE to view all 15 images in our photo gallery.